April 2015, New York, NY — A dynamic advocate for volunteerism, Lisa Stepanian, joins Armenia Fund USA as its new Executive Director. Ms. Stepanian brings with her decades of leadership experiences in the non-profit sector and a strong commitment to community service. Prior to joining Armenia Fund USA, Ms. Stepanian served as the Founder and President of the Armenian International Women’s Association (AIWA) New Jersey Affiliate for over fifteen years. During her tenure at AIWA, she represented AIWA at the United Nations and also served on the NGO Committee on the Status of Women. Additionally, Ms. Stepanian served as a Treasurer for the St. Thomas Armenian Sunday School in Tenafly, New Jersey for ten years. She is also a member of the New Jersey Coalition Against Human Trafficking and an active participant in the Coalition’s initiatives. In 2011, Lisa Stepanian founded Caring Hands Fund, a non-profit charity organization, that raised funds through 2014 and provided critical medical surgeries to underprivileged individuals in Yerevan, Armenia. It is with great enthusiasm and immense passion for making a difference in the lives of Armenians living in our homeland that Lisa Stepanian takes on the role of an Executive Director. “It is a great honor to be a part of an organization dedicated to upholding transparent policies and building strong relationships with Armenia as well as the Diaspora. 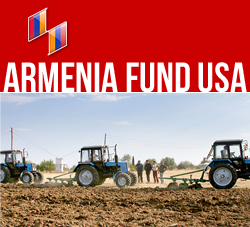 Armenia Fund USA has a longstanding reputation for developing creative and strategic solutions that I resonate with and will strive to sustain. I am truly looking forward to creating and building upon existing social and structural developments. Further, I will play an active role in enhancing our digital presence through media platforms to grow our community engagement and increase public awareness”, said Ms. Stepanian. Lisa Stepanian was born in Yerevan, Armenia and moved to the United States in 1978. Soon after her arrival, she enrolled in New Jersey City University. She graduated with a Bachelor of Science in Chemistry. In 1983, Ms. Stepanian launched a thirty-year career in the Cosmetics and Personal Care industry as a Research & Development Chemist and made significant contributions working with industry leaders such as Revlon, Avon, and Elizabeth Arden. She transitioned into sales representing chemical manufacturers and concluded her career in the private sector as Global Sales Director. Ms. Stepanian resides in New Jersey with her husband and two daughters.